Latvia, Lithuania, and Estonia have a long history of achievement in ceramics, including folk pottery, commercial ware, and sculptural work. After the collapse of the Soviet Union brought independence and democracy to all three nations, ceramic artists responded to their new freedom by moving beyond skillful but guarded creations to more adventurous approaches. NCC’s exhibition will highlight these dramatic new efforts in ceramics with the introduction of nine contemporary makers from across the three countries, who represent the full spectrum of making, age, and education. 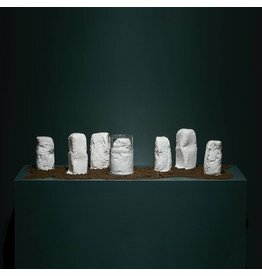 Curated by Sarah Millfelt and Robert Silberman, the show is supported by exhibition liaisons in Lithuania—Tomas J. Daunora and the Kvadratas Cultural Initiatives Group; in Estonia—ceramic artist Juss Heinsalu; and in Latvia—exhibitions coordinator at the Riga Porcelain Museum, Ieva Naglina. Additionally, this exhibition is supported by a curatorial advisor, Anthony Stellaccio, an American scholar and artist. Participating artists include: from Estonia: Kris Lemsalu, Leo Rohlin, and Anne Türn; from Latvia: Diana Boitmane, Dainis Pundurs, and Juta Rindina; and from Lithuania: Ieva Bertašiute-Grosbaha, Danute Jazgeviciute, and Egidijus Radvenskas. Born in Riga, Latvia in 1982, Diana Boitmanehas studied stage design, graphic art, and ceramics. She received her BA in ceramics and her MA in graphic art at the Art Academy of Latvia. 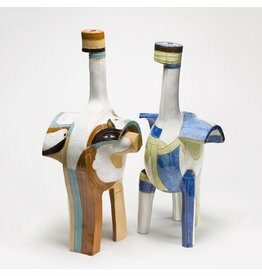 Boitmane’s ceramic work employes minimalist aesthetics and conceptual approaches to the material. In addition to her ceramic sculptures, and under the business name of Malka Porcelain, she creates custom figurines, brooches, and graphic artworks. Boitmane currently lives and works in Vienna, Austria. Danute Jazgeviciute graduated from the Lithuania State Institute of Art in 1969 (now the Vilnius Academy of Art). She has been an active participant in symposia and group exhibitions since 1976, with some 10 solo exhibitions, and a presence in Lithuania, Latvia, Estonia, Russia, Ukraine, Poland, Croatia, and Italy. For 26 years, she was a lecturer at the Culture and Arts Education Institute at the Lithuanian University of Educational Sciences. She says of her influence, “The most important experience and encounter is nature and people surrounding me…. Thus, I communicate my ideas through forms, colors, and surface textures, and I create objects prompted by the impressions, moods, and experiences. Kris Lemsalucurrently splits her time between Berlin and Tallinn. She studied at the Estonian Academy of Arts in Tallinn, at Danmarks Designskole in Copenhagen, and at the Academy of Fine Arts in Vienna. 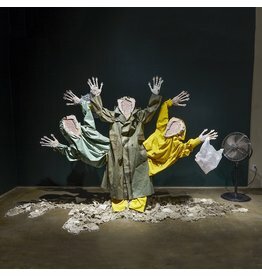 Her ceramic installations combine porcelain sculptures cast in the form of animal or human body parts or objects of clothing. She incorporates myriad other materials such as fur, plastic, wood, and rubber. “Maximalist, visceral, and sexualized, Lemsalu’s pieces evoke the wild, bestial side of human beings and civilizations, and are underscored by feminist themes.” (https://www.artsy.net/artist/kris-lemsalu). Juta Rindinatells stories through her figurative compositions, which read like make-believe theatrical sets complete with props and characters. She often employs porcelain, stone, and other mixed-media into her works. Self-expression is paramount in her work and she’s been making for some 50 years. In the late 1960s, she atttended the Riga Secondary School of Applied Art and later studied ceramics for five years at the Latvian Academy of Art. 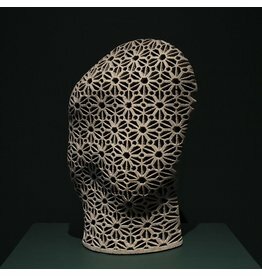 In 2016, Rindina received honorable mention as part of the Latvia International Ceramics Biennale. She currently resides in Riga, Latvia. Leo Rohlinwas born in Tallinn, Estonia, in 1930. He studied ceramics at the Estonian State Art Institute, graduating in 1965. For 37 years, he was a senior lecturer at the Estonian Academy of Arts and head of the department of ceramics between 1974 and 1984 and again from 2000 to 2005. Rohlin’s ceramic mandalas are incredibly time intensive in their creation, often formed from thousands of smaller ceramic elements, each of which is made by hand, bisque fired, glazed using a pipette, and then sprinkled with a powdered cobalt oxide. These “spangles” are later glued onto screw-heads and attached to wooden boards. With an impressive exhibition roster that includes international solo and group shows in such countries as France, Germany, Korea, China, and Lithuania, Anne Türnis an Estonian-based artist. Her body of ceramic work is vast and seductive in surface, with sculptures that take on an animal-like feel and are often placed outside and photographed in situ, akin to a landscape photographer’s capture of an animal in its natural environment. 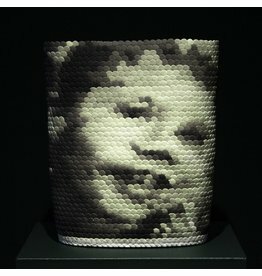 Her “indoor” work can include multi-media “Valgusobjektid,” or light sculptures, that marry porcelain, glass, and hundreds of fiber-optic light strands.